In an BraveWords exclusive, rock journalist Mitch Lafon conducted an interview with filmmaker Alan G. Parker, who is currently working on the official KISS documentary called You Wanted The Best ... You Got The Best, which is set for release in theaters in 2014. Q: How did you become a KISS fan and what has the band meant to you throughout your life? 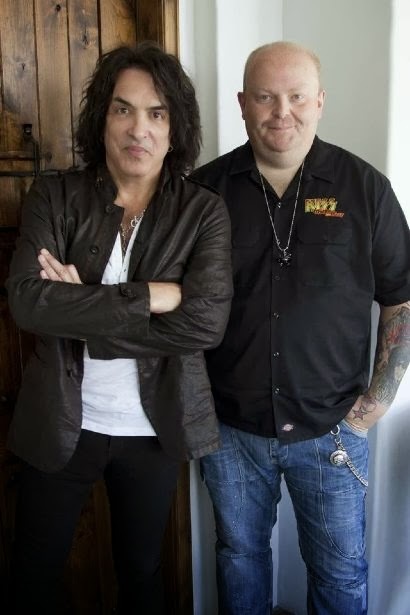 Parker: "I was introduced to KISS by a kid in the year above me at school, he played us the Love Gun album in the school record room and I can honestly say that album changed everything for me. Because I lived in a small town I went to buy it on the weekend and they had no stock! So I finished up with Alive 2. Which is still one of my favourite albums until this day. What they mean to me in life is largely that they are a constant, a lot of things in life come and go. But some things you can rely on." Q: Vinnie Vincent, Ace Frehley and Peter Criss will not sit down with you for the movie. If they had, what would you have asked them, or at least, what would you like to have found out about them? Parker: "The thing about being in a very successful rock band, at the top of it's game, is that every question you could possibly be asked has been asked already. So I knew we could always count on archive. Regarding Vinnie I never thought about putting him into the movie for one minute so far as a new interview goes... I know where he fits, and we have the footage. At the start I thought that both Ace & Peter would jump through a hoop of fire just to be in the movie, to put their side of the story forward. But after offering them both very good money for very little work it became obvious that just maybe a few of the thing I had heard might be true. All ten members of KISS will feature in the movie though." Q: Will the new KISS movie be an accurate account of past events or will it be ‘based on a true story’? Q: Why do you think KISS has been able to survive 40 years? Parker: "Having spent a long time in the music business myself, at EMI Records, I can answer that question quite easily. The cream always rises to the top! It's that simple. Anybody can be 'good' at something, it takes a select few to be 'perfect' at it. "Q: What is the purpose of the KISS film? And do you have complete creative control over its content or have you been told to expound a certain point of view? Parker: "I guess the purpose is to celebrate 40 years of KISS. Although the group have never had a cinema released documentary before either, so that might very well be part of it too. We do have creative control yes, having done a number of these by now I think it's the only way you can approach them. You couldn't work very well based round a storyboard that says 'please skip 1966 it was a dull year!' you know what I mean."